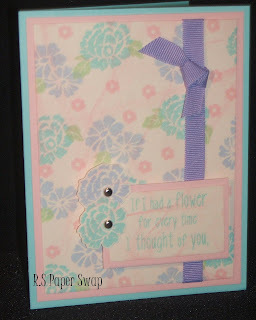 Create with Traci: yeah- swaps are in!! I've received 4 swaps in the last few days!! I'm so excited to finally share the swap I first mentioned (here) . This first card was created by Stacey Borelli. She designed the pretty floral background paper. The second card (to the right) was created by me. This card was so much fun to make!! 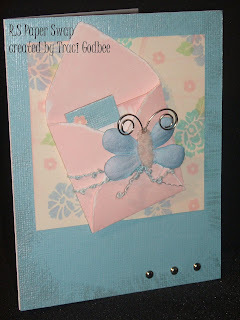 I used Crystal Blue Textured Cardstock edged with the CTMH pearl paint. I created the envelope from Baby Pink cardstock. The butterfly was made by cutting petals from a white Just Bloom from the Big Pinks collection. The pink body was made by cutting the shape from pink cardstock. I adhered white fuzzy sassy strands to the top of the pink cardstock and coated with liquid glass ( i dabbed a bit on and rubbed it over the body with my finger) The sassy strands are still fuzzy looking- but quite hard to the touch. By doing this I 1) made sure those will NEVER come off- AND 2) it allowed the pink cardstock to show through so the body actually looks pink. I tied blue sassy strands around the envelope and uncurled 2 silver spirals for the antennae. 3 silver brads added the final touch. This card was so much FUN!! 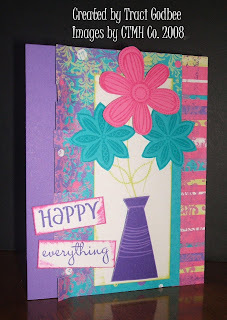 This last card I'm showing was not part of the swap... just a card I made the other night for my June Stamp of the Month demo board. The idea came from (this blog). Basically I was inspired by the way the left side of her card was designed with the cuts/ pleats. I did use the same paper pack although I used different paper from the pack. I'll try to be back the next few days to post more art from the swap- but I'll be leaving town to have a garage sale with my sister (hoping I sell more than I pay for the cost of gas!!) so I'm hoping to schedule posts to keep it going!! Otherwise I'll return Sunday. It's a Zoo out there! !